Italian painter Caravaggio in January 1607 completed work on a unique painting on the biblical theme “Seven acts of mercy.” Before this, artists depicted 7 acts on separate canvases. 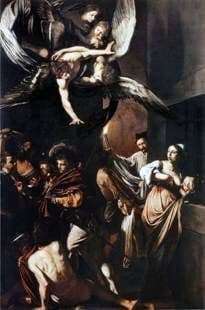 Caravaggio also had to repeat the traditional incarnation in the pictures of instructions from the Gospel. But the artist took a new look at this process. For the Cathedral of Pio Monte, which was located in Naples, Caravaggio wrote a large canvas, on which he placed all 7 acts of mercy. According to the Gospel, the actions of charity include 6 points, and another one of the Old Testament is added to them. Christian tradition recommends that every believer perform the following good deeds: give food to the hungry and water to the thirsty, shelter the wanderer, share clothing with naked, visit the sick and imprisoned in the dungeon. The last item added is the admonition to bury the dead. All acts of good deeds Caravaggio fit in a single composition. The image seems chaotic, but it only reinforces the impression of the shown plots. On the right, the woman feeds the prisoner, looking around with apprehension. The artist combined in one scene two acts: feed the hungry and visit a man in prison. Near the woman we see a funeral procession. The body is carried out, lighting the way with a burning torch. A young man standing nearby breaks his cloak to share clothes with two poor people: one is sick and the other is naked. On the left side of the canvas, the hotel owner accepts a lonely wanderer. Slightly higher Samson from the jaw of an animal quenches thirst. For everything that happens, they look at Mary with the Baby and a pair of angels. Caravaggio made a masterful combination of many plots. In the portrayed felt pathetic mood. With the help of shadows and glare of light, the painter gives the painting a dramatic character. It turns out amazing work in the traditional Baroque style.